Anna Maria Maiolino, inATTO, 2015. Performance View, Galleria Raffaella Cortese, 2015. Two things about Anna Maria Maiolino’s show are particularly striking: The first is the quality of her recent production. Her latest works (this show, with a few small exceptions, consists of pieces from 2014 and ’15) are among her freshest and most inspired yet. The sculptures, in raku ceramic or cement, vie with her drawings to define a profoundly personal, biomorphic language that combines the artist’s manual gestures, the nature of her materials, and chance elements. The exhibition’s second striking feature is more general: its evidence of Maiolino’s capacity to communicate on an intuitive and sensitive level. Viewers need not know the affinities between her work and Brazilian Neo-concretism or notions of phenomenology—topics often discussed in critical writings about the artist—in order to instinctively grasp the essential coordinates of her work: an experience of the sensual (and sexual) world; an amorous interest in the living body; a stubborn overhaul of “humanistic”—to a great extent patriarchal and rational—culture, in the name of the body itself and its rationales. 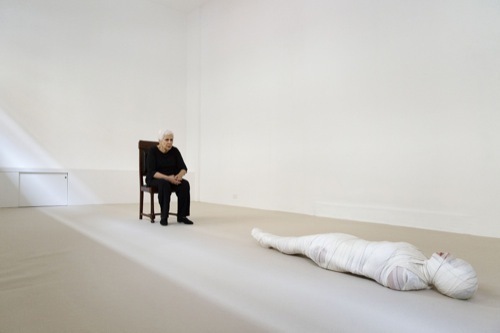 These same coordinates are precisely defined in inATTO, a performance she created on the occasion of the show’s opening, based on an intense dialogue comprising not words, but smiles, gestures, and inarticulate sounds exchanged between Maiolino and Sandra Lessa, a young Brazilian actress and performer, who began the performance wrapped in bandages like a mummy but ended up freed—and dancing.